We’re excited to introduce our new Results@Hand event registration tool for event planners and organizers! We designed this cutting-edge software to integrate directly into our entire suite of Event Management apps and provide a seamless experience for administrators and (especially!) attendees. No more importing cumbersome CSV files or asking your members to download multiple apps to register, check in & sign up for workshops — we’re making it easy from start to finish because, after all, first impressions matter! Our new online event registration is completely self-service. It takes only minutes to set up your branded registration page complete with your logo, ticket types, payment options & more —no technical knowledge required! But, of course, our live customer support is there to help when you need it. Create an easy-to-use registration page where your members and attendees can register and begin receiving important information. Easily and intuitively add multiple registration types and tickets. Offer special rates with promo codes to drive sales or push users to key ticket types. Let your attendees check-in directly from their phone or scan them in when they arrive on-site using an automatically generated QR code. Pick your perfect booth based on location, your neighboring booth holders and price before you buy. 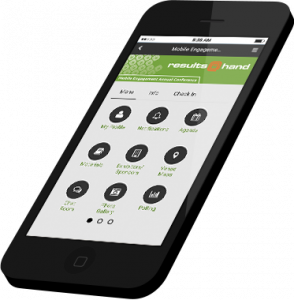 Our Results@Hand registration app works hand in hand with our Event Management app and its entire suite of tools. Special discounts available when you bundle our products! Capture all of your registration and check-in data as it happens, then leverage the data to react to user trends. Fill in our intuitive event information form with details about your event, location, dates. Start with our attendee, exhibitor, sponsor registration form templates and simply drag and drop new fields, etc. Voila, you have a mobile-responsive registration website! Is it Time for a Paperless Conference?